More and more, we’ve seen that people are trying to make a difference out there, and while the non-renewable industries have no problem funding dozens of front groups and pundits, there doesn’t seem to be the same support on the side of sustainability and conservation. 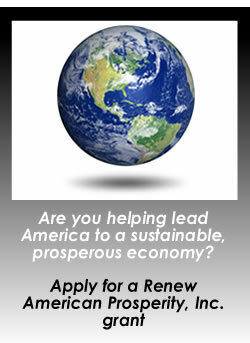 Renew American Prosperity, Inc. was formed to try to balance the scales. To give a helping hand to the people and groups that are leading our nation back to prosperity in a smart and sustainable way. Renew American Prosperity, Inc. is a non-profit organization formed to raise and distribute support to organizations, campaigns and people working to rebuild a sustainable American economy. We have been awarded 501(c)4 status.